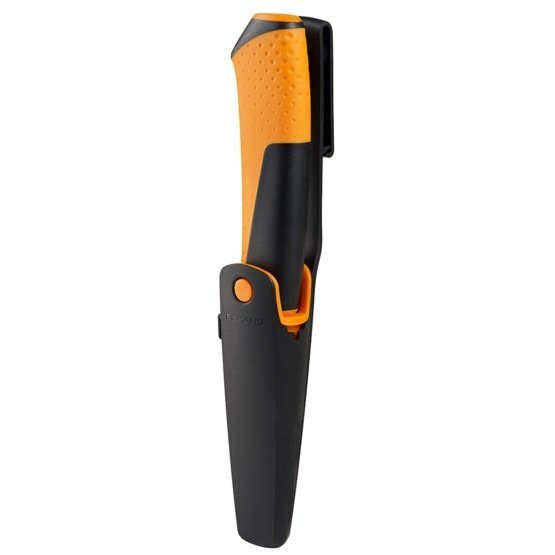 Fiskars Universal knife with sharpener is a utility knife with a high-quality steel quality blade for general use. It is part of a new range of utility knives with an integrated sharpener that has been developed jointly with the most demanding knife users. The innovative easy-to-use sharpener is always with you guaranteeing sharper cuts without any interruptions to the task. The handle provides an ergonomic soft grip, with unique patented grip pattern designed to give the best grip and control precisely where you need it, and providing a smoother surface where more mobility is required. The innovative sheath has a reversible collar allowing for either left or right-handed use.